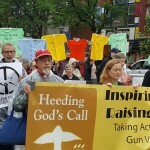 Fran and I participated in the May 16 Demand the Ban (on the sale of assault weapons) nonviolent direct action outside Senator Toomey’s office in Philla. 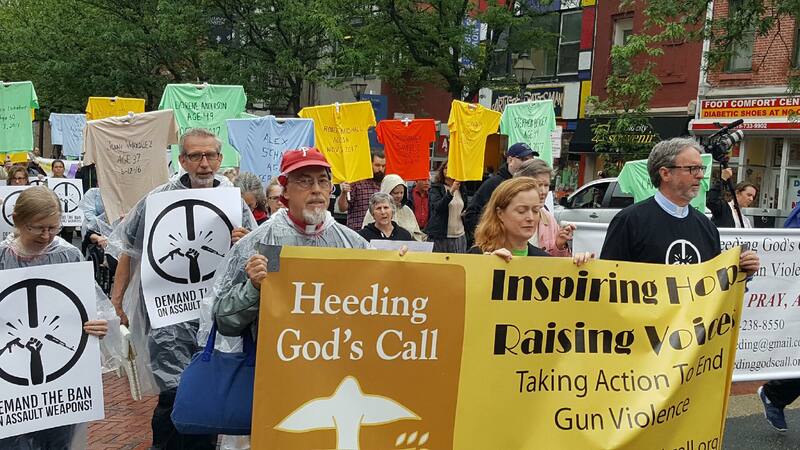 First an assault weapon was melted and re-forged into a garden tool, which we carried to present to the Senator and to insist on his support for S2095 banning the sale of assault weapons. 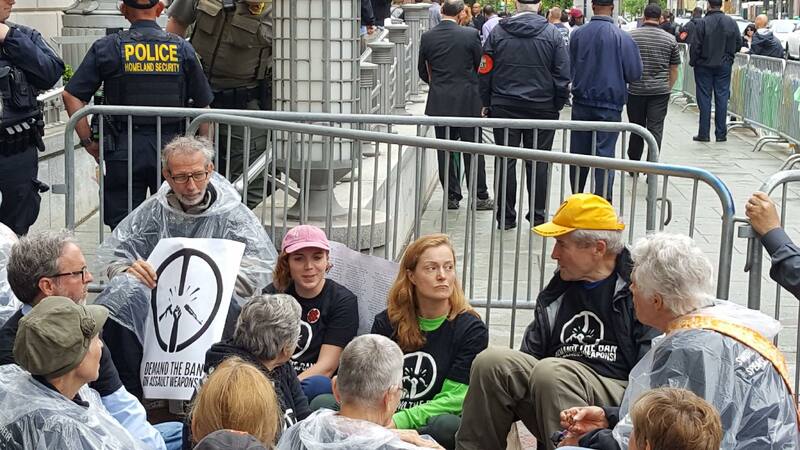 We arrived to find barriers surrounding the building housing his office, so those of us prepared to do civil disobedience sat down at the barrier entrances while others participated in the legal demonstration in the street. Eventually (in a misty rain) thirty-three of us were arrested and most of us were escorted to a nearby Sheriff’s bus where we were cited (Failure to disperse) and released (a sub-group was arrested by Federal police and cited in place). It was a particularly simple and expedient arrest, while I was fully prepared to stay there for as long as it took. No pictures of my own because I had left wallet, phone/camera and all jewelry (i.e. wedding ring) with our Demand the Ban security team (retrieved after the action). You always learn something new. I had removed waist drawstrings from a couple of pullovers as part of the preparation-for arrest procedure. Experienced no difference without them and so won’t bother to replace them. If you write a phone number on your arm, be sure to use heavy indelible ink. My “permanent” Sharpie marker rapidly became illegible in the rain. Does repeated arrest for a civil disobedience sometimes lead to it being seen simply as performance/theater and thus disconnected from reality, when in fact we are trying to demonstrate on-going commitment in the face of legal attempts to shut us down? Any campaign has some repetition and theater, for publicity and planning, while also some degree of unexpectedness (for which you prepare). Does this repetition lessen the value of each individual action? Doubtless yes, to some extent, but that does not negate the value of having an overall consistent campaign with a consistent goal. Demonstrating faithfulness to a cause is a different and particular value, which accrues with repetition. 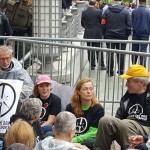 Civil disobedience has earned an acceptable role in our toolbox of actions, but a drawback is that it may seem so commonplace nowadays that it does not have as much value as it once did. Public civil disobedience is a particular category of arrest and atypical in some ways. If police treat us very nicely and appear even disarmingly friendly, what does that mean? Are they simply expressing their training that directs them to work to defuse an arrestable situation, for everyone’s’ safety and well being? Or are they trivializing the action to make it an “as if” arrest and not of any real power or commitment? Generally the Work of doing civil disobedience is not the arrest per se, but the effort in the right preparation, and sometimes it is in simply showing up (on Martin Luther King snowstorms, etc) and of endurance.